This study aims to improve students' activity and learning achievement in science subjects of natural resource materials using Group Investigation Methods in grade four students of SDN Tambakromo 2. This research belongs to Classroom Action Research (CAR). The subject of this research is the fourth grade students of SDN Tambakromo 2 with the number of students is 22 students. The results showed that there was an increase in student learning outcomes after learning by Group Investigation study method. In addition, guidance from teachers also helps in the learning process. In first cycle the average score reaches 63, and in second cycle the average score reaches 69. For the students' learning completeness, on the first cycle reached 63.18%, while in the second cycle reached 77.27%. Thus, the fourth grader of SDN Tambakromo 2 has achieved a learning mastery in a classical manner. From the results of the study also showed an increase in student learning activeness. This can be seen from the percentage of students' learning activity in first cycle is 31.81%, increased in second cycle to 63.53%. The increase from first cycles to second cycle is due to students being able to investigate themselves as well as in groups of existing problems, so that students can solve and find answers to the problems. SUPRIYANTO, Djoko Hari. PENINGKATAN KEAKTIFAN DAN PRESTASI BELAJAR SISWA PADA MATA PELAJARAN IPA MELALUI METODE PEMBELAJARAN GROUP INVESTIGATION KELAS IV DI SDN TAMBAKROMO 2. 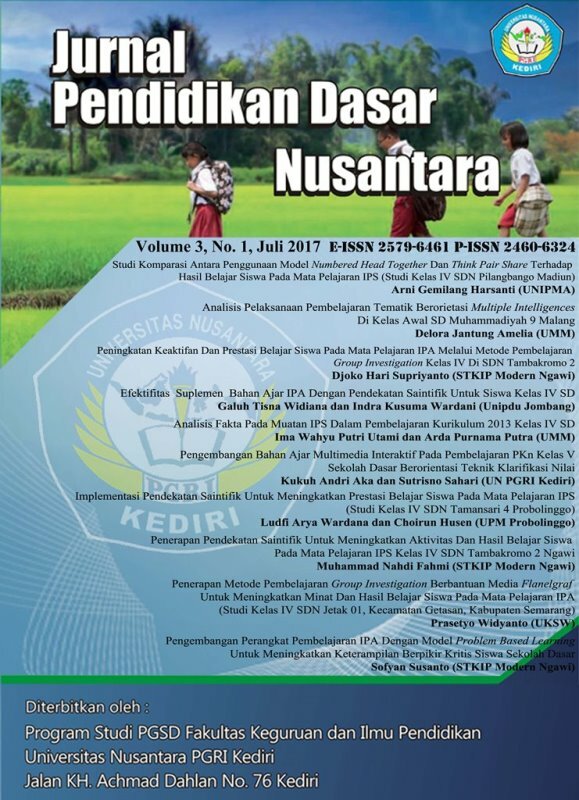 JURNAL PENDIDIKAN DASAR NUSANTARA, [S.l. ], v. 3, n. 1, p. 29-40, july 2017. ISSN 2579-6461. Available at: <http://ojs.unpkediri.ac.id/index.php/pgsd/article/view/748>. Date accessed: 25 apr. 2019.